When it comes to eating chicken, beef, pork, and fish, it is customary to use certain spices to flavor your meals with. When you are living with kidney disease, however, the spices you use need to be low sodium or salt free. This is to avoid the potentially dangerous and uncomfortable consequences of allowing too much sodium into your body when your kidneys are not able to process it. This does not mean that your meals will be without flavor, however. In fact, most people find that using herbs and other low or no salt options actually brings out the flavor of the meat rather than masking it. So you may figure out that you actually enjoy food more now. Garlic— Let’s be honest, garlic tastes good on anything. Garlic in any form can be used to flavor chicken and perfectly pair with just about any side dish. Avoid using garlic salt and stick to garlic powder, minced garlic, or best of all, fresh garlic. Paprika and Rosemary— For a lovely bit of color and aromatic burst of flavor, sprinkle some dried paprika and fresh or dried rosemary over your chicken before you bake or grill it. Lemon and Herbs— Lemon is an underrated flavoring that should be used a lot more often. A squeeze of fresh lemon and some fresh or dried herbs like thyme, sage, and oregano will smell and taste simply amazing. Garlic and Red Pepper— The combination of garlic and spicy red pepper spices up beef in any form. Either mix in with your ground meat, or rub your steaks or roast with the mixture. Minced garlic is best for this, but you can use just about any type of garlic that is salt free. Thyme and Oregano— These two herbs, commonly found in Italian spice mixes, pair perfectly with each other and bring out the flavor of beef perfectly. This is especially perfect for Italian inspired meals. Sage— Sage isn’t just for Thanksgiving turkey dressing. Sage’s soft and aromatic flavor is a perfect complement to the sweet and savory taste of pork. Paprika— Any kind of paprika will work, but a nice smoked paprika goes perfectly with pork of any kind. Just sprinkle over the meat before baking or grilling to bring out a sweet, smokey flavor. Coriander— Coriander isn’t widely used, but it is a delicious and almost floral spice that pairs perfectly with pork. Garlic and Lemon— It might almost be too simple, but you can’t go wrong with some fresh garlic and a squeeze of lemon on any kind of fish. Lemon and Rosemary— Lemon pairs too well with fish to just have one option, so try some fresh sprigs of rosemary with a splash of lemon juice. Cilantro— Cilantro gives just about any fish a refreshing burst of flavor, and also goes really nicely with a little squeeze of lime. These are just a few of the many options you have to flavor chicken, pork, beef, and fish, and all of these are completely salt free. Once you stop covering up the natural flavors of these foods and instead enhance it with the bright flavors of herbs and spices, you might find that you enjoy the taste of food much more. 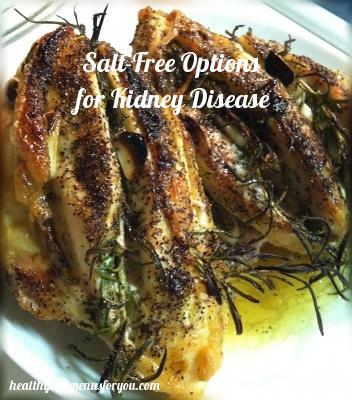 You can still put a lot of flavor in your life and make great choices for kidney disease. For other tips on things you can do with kidney disease, and how to still live a full life with kidney disease you can also read my sister blog! !